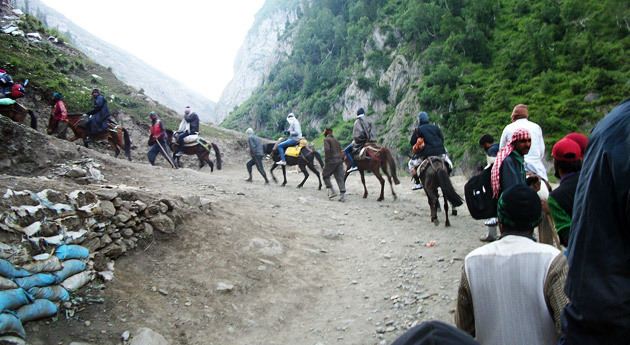 ﻿	Amarnath Yatra Package via Pahalgam – 5 Night Tour. Dedicated to Lord Shiva, Amarnath is one of the most revered shrines located at an altitude of 12,756 feet in the region of Himalayas. Amarnath cave holds immense importance among the Hindus and is visited by thousands of devotees every year. 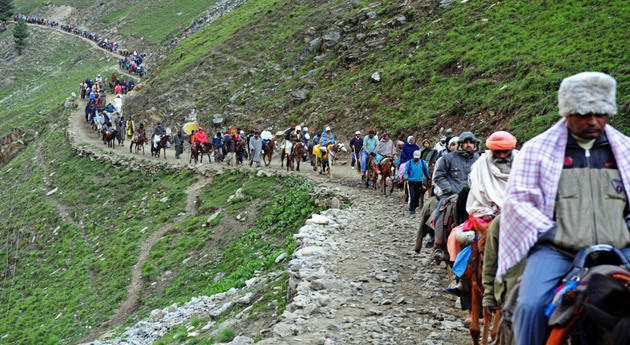 Amarnath Yatra from Pahalgam by Road is a 6 days/ 5 nights pilgrimage tour package that takes you to the holy cave of Amarnath. This tour also includes a visit to Srinagar(sightseeing). Visit the beautiful Mughal Gardens and Dal Lake of Srinagar. Embark on this sacred Yatra to seek inner peace. Throughout your trek adore the natural beauty of major destinations such as Pahalgam, Chandanwari and Panchtarni. With continuous chants of ‘Jai Bholenath’, pay a visit to blessed Amarnath shrine and perform holy services to Lord Shiva. On reaching Srinagar Airport, meet our IHPL representative who assists while you take a transfer to Pahalgam by road. Check-in at the hotel and stay overnight at Pahalgam. This early morning, take a transfer to Chandanwari. 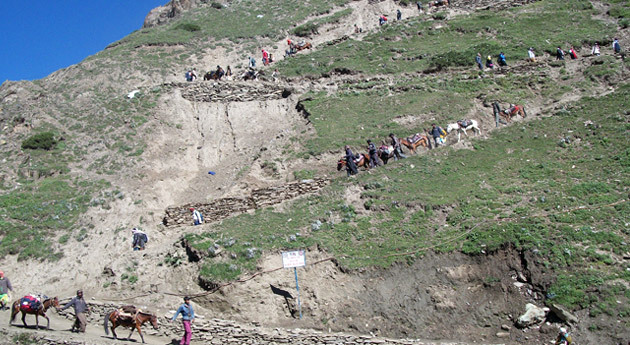 On reaching Chandanwari, begin your trek to reach the first stopover- Sheshnag. En-route, special meals will be provided to you. Deluxe tents with complete bedding and hot water bottles (warm beds) will be provided for a comfortable stay. Head towards your second stopover, Panchtarni in the morning. On reaching, take some rest and then move towards the Holy Cave of Amarnath, which is located at a distance of 6 km from Panchtarni. Go for Darshan and then return to Panchtarni for night stay. Enjoy special meals en-route. For your comfort, deluxe tent with complete bedding and hot water bottles (warm beds). Leave from Panchtarni for Pahalgam in the morning by Palki. Enjoy your lunch at Sheshnag and reach at Chandanwari by late afternoon. After reaching Chandanwari, take a transfer to Pahalgam by vehicle. Stay overnight at a hotel at Pahalgam. After having your breakfast, leave for Srinagar. On reaching, check-in your Hotel/House boat. 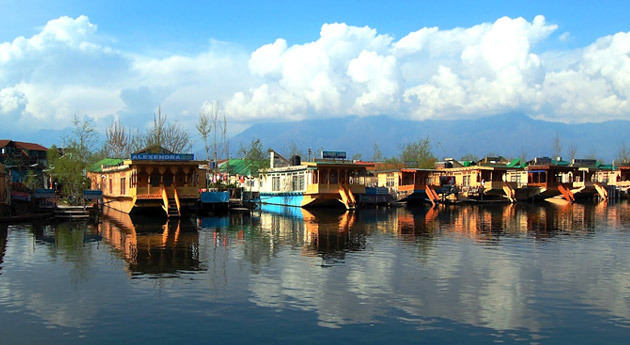 Take some rest and then leave for a half day sightseeing tour of Srinagar. Pay a visit to the Mughal gardens, Nishat Bagh (the garden of Pleasure) and Shalimar Bagh (abode of love). Located near the serene Dal Lake, the Mughal gardens are immensely beautiful. En-route, visit a carpet-weaving factory. Get back to the hotel for dinner and stay overnight. Take a transfer to Srinagar Airport/ Bus Stand after having your breakfast. On reaching connect with your onward journey.